In the early 1980s, Donna Millican took quilting classes from a woman named Barbara, who taught techniques now called old-fashioned. 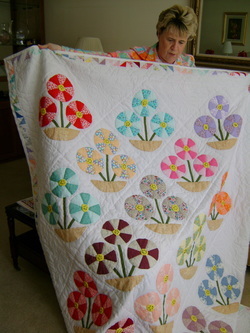 Out of those classes, she developed a love for applique and hand quilting. From that beginning, a bee called Naper Needlers formed and sewed together for some years, choosing a pattern for all to share the work on, cutting, hand piecing, and hand quilting on a large wooden quilt frame in one of their homes. When the quilt was complete, their names were placed in a hat and one drawn to determine who received the quilt. 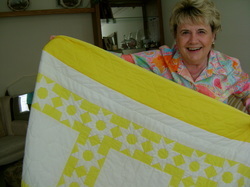 Although the bee is no longer together, Donna is quick to show off a lovely yellow and white quilt which she acquired that way. ​Growing up in Chicago’s old Austin area where she attended St. Providence High School, she tells of taking the Lake Street El and buses to travel downtown. For a time she taught first and second grade and later became an account executive for an insurance brokerage. She and her husband came to Naperville thirty-eight years ago. She continues to love hand quilting, having changed from a large wooden frame to the smaller white plastic that snaps together in a jiffy, ready for her to stitch by a sunny window. She learned about Riverwalk Quilt Guild from a church friend, Heidi Enright, in 2005 and has served as Hospitality Co-Chair since then. 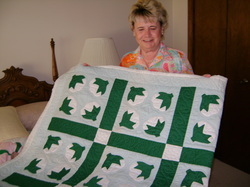 She is a member of The Material Girls Bee as well as the Grace United Methodist Church Quilting Bee. Donna especially appreciates the stories of how quilts come to be made. Her hand worked Martha’s Vineyard will be hung in the guild’s 2016 show. Pink Dogwood is one she made for her mother’s 90th birthday. Cotton Boll, which she inherited, was made by her mother-in-law from a pattern found in a craft drive at the 1982 World’s Fair in Knoxville, Tennessee. Her most recent work, Flowers in a Bowl, is, of course, completely hand-stitched.